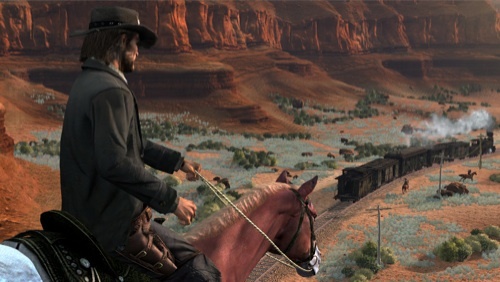 Red Dead Redemption was shown off behind closed doors, Rockstar's latest action western title. The game is an open world title set in the year 1910 in a fictional desert region. 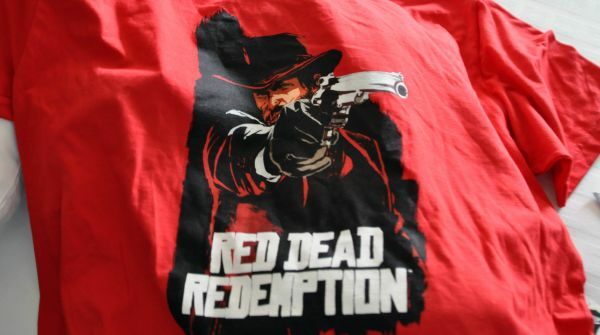 You play as John Marston, a gritty cowboy who was thrust back into a world with the Bureau, a organization used to hunt down criminals and gangs. While PR wouldn't confirm if the game had co-op or not, something we strongly hope for, what we did see impressed us. The demo opened with a classic western shootout. John slowly strutted up in an attempt to do a prisoner exchange for his friend Bonnie. It quickly went south and the demo'er showed off the Deadeye targeting option for quick shooting. One outlaw was shot in the leg, and he fell with realistic animation thanks to the game's Euphoria animation engine. This yields location specific damage for all characters in the game, including horses. Bonnie was quickly shuffled away in the chaos of the fight, and once the smoke cleared, she was strung up to be hung. Outlaws popped up all over the town as John and is band of merry men quickly worked their way towards her. Red Dead Redemption uses a cover system similar to Gears of War, and it wasn't long until he freed her friend. Of course a battle like this yields lots of bodies, and instead of simply having them disappear Rockstar came up with a better solution - vultures. Any animal seen in the game including rabbits, wolves and deer can be hunted and their pelts sold for profit. After the proceeding battle John hopped on his horse and took off through the country side. During the trek to the next town we passed families in coaches, cowboys camping, and outlaws hooting and hollering dragging an enemy behind. All of these encounters are completely random and procedurally generated in the game. There are three main areas of the game, each reportedly bigger than all of Liberty City in Grand Theft Auto IV. One area (seen in the above screenshot and in the demo) resembles west Texas and Arizona, with sparse greenery. Another is reminiscent of the dry, sandy Mexican plains, and the third a more mountainous forested area...like Colorado. If you can see it, you can go there -- the world of Red Dead Redemption is the biggest Rockstar has ever made. Red Dead Redemption is all about being good or being bad. Your actions can increase your wanted level, and decrease what people think of you. Walk into a town as a wanted man and you may find someone drawing a gun on you. Overall I was really impressed with what I saw of Red Dead Redemption. Rockstar is known for their great exposition in games, and the setting and style of RDR looks to bolster it. Page created in 0.4582 seconds.